2017 was a big year for Wealthy Affiliate releases. The internet marketing training platform released 12 internet marketing tools in just one year. That is basically 1 release every month. Some releases were feature enhancements to existing Wealthy Affiliate products. Some releases were completely new product introductions. All 12 releases have contributed to a rapidly growing community inside Wealthy Affiliate, and internet marketing in general. Below are detailed release notes for each new internet marketing feature or product. Click any link above to go directly to that feature release detail. In January 2017, Wealthy Affiliate released Free SSL Certificates for every premium website. Secure Sockets Layer (SSL) certificates are used to encrypt connections between a user’s computer and a website. These certificates secure your website and keep your information safe. SSL certificates are especially important when you buy products online. You want your credit card numbers, your home address and personal information to be safe and kept secret. You don’t want your personal information shared with anyone who doesn’t need it (e.g. hackers). And search engines like Google can rank websites with SSL certificates higher because they have a secure layer of protection. Wealthy Affiliate provides a variety of internet marketing tools including website hosting and website creation products to build any type of website. You can build an eCommerce website where you sell products online. Most website hosting companies charge extra for SSL certificates. GoDaddy charges $50+ a year for one SSL certificate on one website. Wealthy Affiliate premium membership offers a free SSL certificate for every website. In March 2017, Wealthy Affiliate released new training features for the designated internet marketing training courses. The new training features provide better training experiences for every Wealthy Affiliate member. The new features include course tasks which tracks a list of actions needed to complete along with each training lesson. And a list checker that provides a way to check off each task when the task is completed. The trainings also include a smart training menu that keeps up with where you leave off in the training. When all tasks are checked and the course is completed, the smart training menu will direct you to start the next course. Wealthy Affiliate provides two main training courses for getting started. The first course is the Online Entrepreneur Certification (OEC). The OEC course provides training on how to monetize websites by learning online marketing skills. 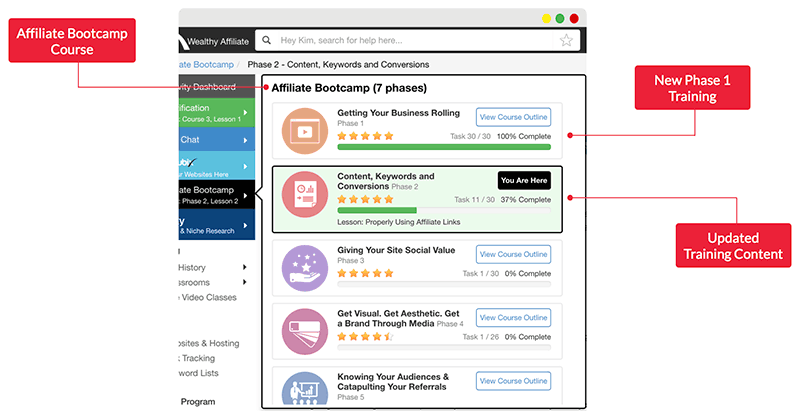 The second course is the Affiliate Bootcamp. The bootcamp course provides training on how make money with the affiliate marketing program within Wealthy Affiliate to make money from referrals. In April 2017, Wealthy Affiliate released a completely redesigned website builder called SiteBuilder 2.0. SiteBuilder 2.0 improves the way to install and create new WordPress websites. This release included a complete redesign and new user experience to make creating websites a super easy process. Wealthy Affiliate offers one place for training, tools and community support. These tools include website creation tools and managed WordPress hosting services. In May 2017, Wealthy Affiliate released SiteSpeed, a new product designed to improve website performances. SiteSpeed is a website caching platform that saves static versions of website pages and posts. This caching provides quicker page load times which makes websites run faster. The release of SiteSpeed reduces the need to download WordPress plugins to improve website speed. The SiteSpeed product within Wealthy Affiliate is designed to handle site speed for you. And search engines like Google can rank fast loading websites higher than slower websites. In June 2017, Wealthy Affiliate released a new content management product called SiteContent. SiteContent is referred to as the ultimate writing platform. The writing platform is a place to create and publish content to websites. You can create media rich content with styled text, images and links to other pages or websites. 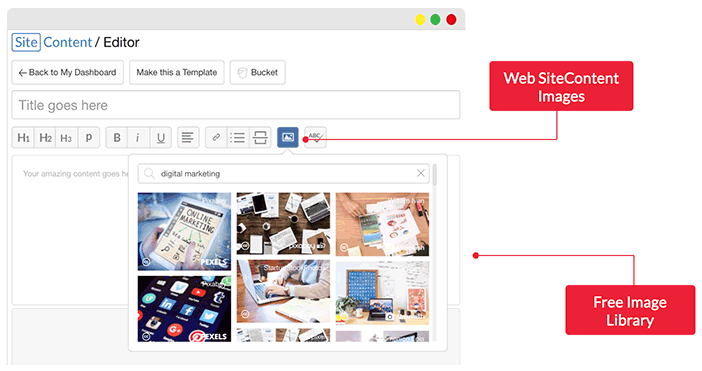 You can easily manage content for one website or multiple websites in one consolidated content manager. And it is easier to manage websites when all the management tools are in one place. Wealthy Affiliate training teaches how publishing frequent content is an important digital marketing strategy. Websites that have new, fresh and engaging content tend to rank better in search engines. Better rankings lead to more website traffic. More website traffic leads to more money making opportunities. Also in June 2017, Wealthy Affiliate released Affiliate Bootcamp 2.0, an improved affiliate marketing training course. Affiliate Bootcamp 2.0 contains a completely new phase 1 training set. The existing training phases and lessons were also updated with new content. The Affiliate Bootcamp is a training course to how to promote the affiliate program within Wealthy Affiliate. You learn how to build a website that targets groups of people who would be interested in Wealthy Affiliate. The bootcamp training course contains 7 phases with 70 lessons. Each lesson has related tasks to check off as you move through the training. You learn how to build a website that targets people who would be interested in what Wealthy Affiliate has to offer them. In July 2017, Wealthy Affiliate released Jaaxy 3.0, a supercharges and enhanced keyword research tool. Jaaxy supports the ability to perform keyword search analysis, alphabet soup search techniques, brainstorm features, saved keyword lists, and more. Jaaxy 3.0 includes navigation improvements, keyword suggestion improvements and a new version of SiteRank. SiteRank features the ability to monitor where your site ranks within all major search engines. The Wealthy Affiliate training courses cover the importance of marketing research and understanding your website’s target audiences. The idea of keyword research is to uncover what people are looking for and create targeted content for them. In August 2017, Wealthy Affiliate released updates to the Ambassador Platform. The Wealthy Affiliate Ambassador is an internal ranking system and program for all members. The individual member ranks are a way to encourage members to help other members, create helpful content and have an active presence within the Wealthy Affiliate community. The more a member answers questions from other members or creates consistent blog updates or completes more training, the higher the member’s rank will be. The Ambassador Platform release enhancements includes updates to the ranking algorithm and real-time updates on the activity dashboard. The ranking algorithm improvements are designed to prevent Wealthy Affiliate members from gaming the system. The Ambassador dashboard shows real-time rank updates for the top 25 Ambassadors and the top 200 ranked members within Wealthy Affiliate. In October 2017, Wealthy Affiliate released SiteContent Images. SiteContent Images is a library of free images to be used in website blog posts and pages. The image library provides access to more than 1 million free images. The SiteContent image library makes it easy to add visuals to your website content and make the content visually pleasing. All images are high resolution and free to use with a Creative Commons ZERO (CC0) license. CC0 means you can use the images freely for personal use or business use. You can use these images without payment, fines or attributions. SiteContent also includes an image compression feature which minimizes images to the smallest file size. Image compression can help improve the overall speed of the website which can improve search engine rankings. Also in October 2017, Wealthy Affiliate released an integration with Google PageSpeed Insights. PageSpeed Insights is a website analysis tool built by Google that checks the speed of all website pages and posts. The tool provides speed scores on how fast the content loads on mobile and desktop devices. Google even provides suggestions on how to improve the speed scores. Since website speed is an important factor in ranking higher in Google, Bing and Yahoo, it is a very important process to analyze how fast your website site loads. The beauty of PageSpeed Insights integration within Wealthy Affiliate is that it uses Google’s functionality. But you never have to leave the Wealthy Affiliate platform. This allows you to check the speed of your websites and perform other related website management tasks all in one place. In December 2017, Wealthy Affiliate released an integration with Jaaxy, a keyword research tool created by the same founders of Wealthy Affiliate. If you read the Jaaxy 3.0 release update in July, then you already know Jaaxy is a pretty jazzed up keyword research tool. However, Jaaxy was previously accessed outside of the Wealthy Affiliate platform. The separate platform required you to access Jaaxy separately with a separate log in. The Jaaxy integration offers direct access and keyword searches inside of Wealthy Affiliate. The new integrated Jaaxy keyword tool will replace the previous keyword tool that was not as robust as Jaaxy is. The old keyword tool was the first product iteration of a keyword research tool. The development of the first product eventually led to the development of a much improved product version named Jaaxy. Also in December 2017, Wealthy Affiliate released new video technology and a new video player for training videos. The new video technology uses HLS technology to automatically deliver videos in the highest streaming speed quality based on the internet connection speed it detects. The streaming technology also includes HD quality. If you are on a faster internet connection, you will automatically get higher resolution video. If you are on a slower connection, you will automatically get a video resolution that will play well on your internet speed. The new video technology also improves the speed of the video load times and provides control how fast the video plays. Training videos are a key part of the Wealthy Affiliate tool set. The two main training courses contain videos within each lesson. And new live trainings for various topics are added on a weekly basis. The trainings, tools and support from the community are all designed to help increase chances for success. Wealthy Affiliate certainly covered a lot of ground with releases in 2017. And the founders of Wealthy Affiliate say 2018 is going to be their biggest year yet. Interested in what Wealthy Affiliate is? Here’s more on Wealthy Affiliate offerings, tool sets and training. Just leave your questions or comments below. Thanks!